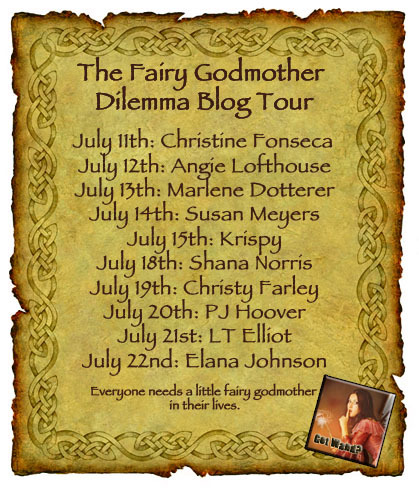 In two days Danyelle Leafty is kicking off her blog tour celebrating the release of her book, THE FAIRY GODMOTHER DILEMMA. The fun all starts on Monday with Christine Fonseca. Don’t miss out! Danyelle Leafty writes MG and YA fantasy. In her spare time, she collects dragons, talking frogs, and fairy godmothers. She can be found discussing the art of turning one’s characters into various animals, painting with words, and the best ways to avoid getting eaten by dragons on her blog. 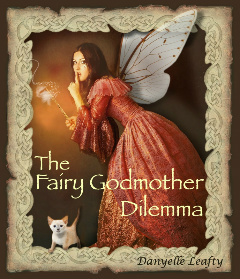 Her serial novel THE FAIRY GODMOTHER DILEMMA can be found here. You can contact her here. Sixteen-year-old Breena doesn’t want to leave the faerie queen’s court, and she doesn’t want a fairy godmother. But if she has to choose between the two, she’d leave the Faerie Realm over getting bossed about by a faerie with a pointed stick any day. Unfortunately, her attempt to evade her fairy godmother gives her growing pains in the form of fur, whiskers, and a tail. Turning into a cat is the least of her worries, though, because the potion wasn’t meant to bring out her inner feline, it was meant to put her to sleep. Forever. If Breena wants to make it to her Happily Ever After, she’ll have to accept that sometimes having a fairy godmother makes all the difference in the world. I’m thrilled about the release! Ooh, that sounds like such a good read! Danyelle is such a great member of the Blue Boards. I always enjoy her thoughtful posts–and she manages to come across as so kind even while making her point on controversial topics. I can’t wait to check out her fiction.